I am a newbie user of Axoloti and Axocontrol. I am trying to build some patches to transform Axoloti in a multieffect. 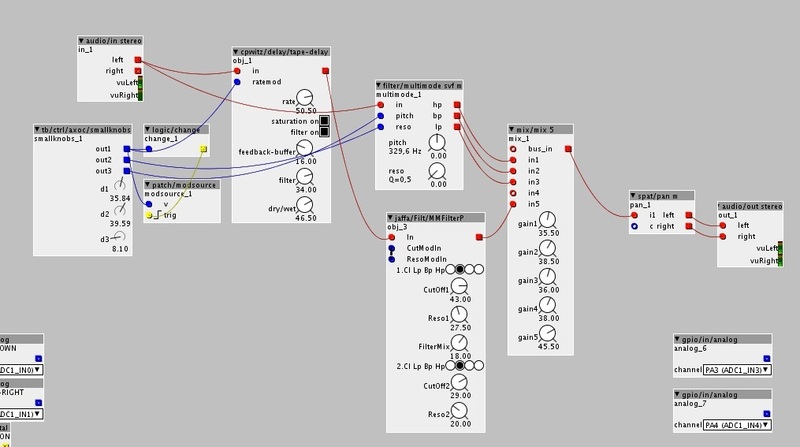 I did some single patches of delay, reverb and chorus. 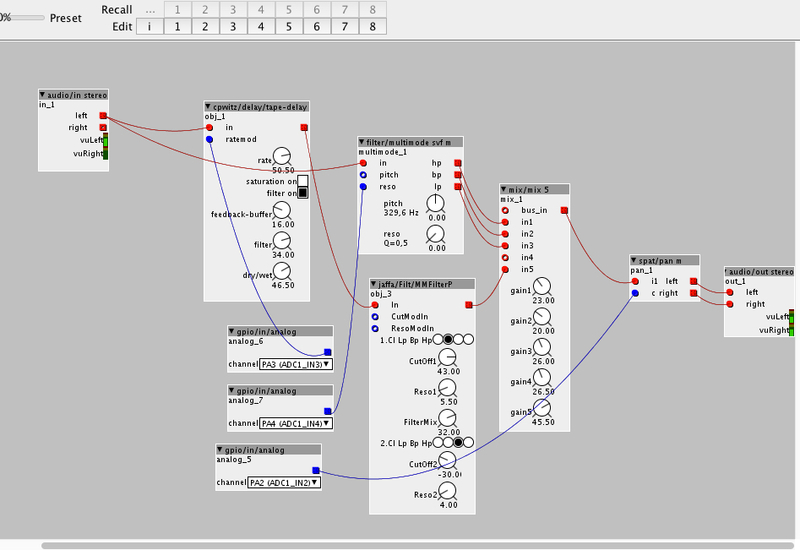 But now my problem is: how can i do to create a multieffect that i can control with Axocontrol? each knob/joystick has a different GPIO port and numbers (as do the leds for outputs) you will also find it useful to filter the analog inputs, as they naturally have some movement. Ive just created a set of objects in the object library which I use to abstract this, one for each 'group' of controls ... it also display current values, which i find useful, they also have a light filter on the analogue inputs, so the readings are fairly stable. if you pull up one of the objects, you will find a help file attached, that shows them all in use. Axocontrol is the modular thing add on board right? There are 2 different versions, one using the gpios directly and one that converts them to midi messages. And it has got two layers, so two functions pr. knob. See further description in the patch and in the thread. i see all the objects that u did but not the folder called "ctrl"
what do u mean with "u need to to sync libraries"? then go to the control you wish to control, and right click and select the mod source, and the amount you want it to be modified by. the nice thing is you can use the mod source for multiple controls, and also specify an 'amount'. there are a couple of limitations, e.g. the checkbox cannot use this, so you would need to change the objects to bring these under control of axo control... but its a good 'starting point' to get something up and running quickly. anyway, apologies if you already knew this, but in case you didn't I thought it might be helpful. 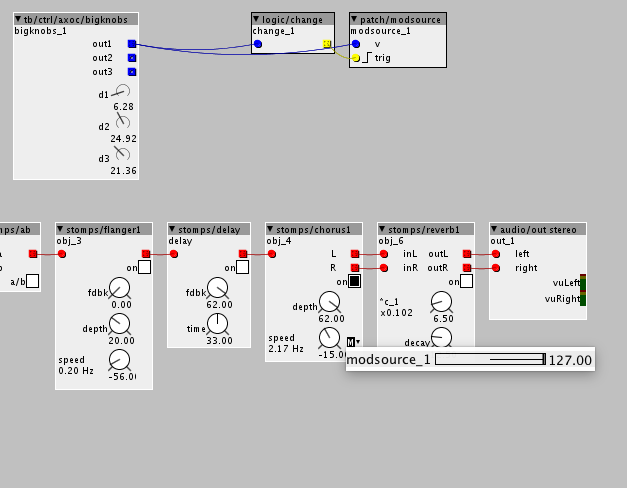 - have multiple demux one of each knob, using the same toogle, so then its like 2 pages for knobs. @thetechnobear - These axocontrol objects are so helpful!! Thank you so much! But please can you explain what the bool input and output does on tb/ctrl.axoc/joystick ?